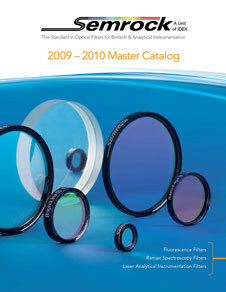 ROCHESTER N.Y. – Semrock announced the release of its new 76-page, full-color 2009-2010 Master catalog of optical filters and related products. This comprehensive catalog contains additional Technical and Product Notes along with four brand-new product families and dozens of new filter products optimized for fluorescence, Raman spectroscopy and other laser analytical instrumentation applications. New product families highlighted in this catalog include new Image Splitting Dichroic Beamsplitters which offer superb image quality for both transmitted and reflected light due to an extremely high degree of flatness, and sport wide transmission and reflection bands (from 350 to 950 nm for every filter). New BrightLine multi-laser fluorescence filter sets are designed for advanced microscopy systems (including TIRF and confocal microscopes) and are available for the most popular laser combinations including 488/561 nm (ideal for live-cell imaging with GFP/mCherry, for example) and 405/488/561/635 nm wavelengths. Also new in time for this edition are the first of a new family of filters for controlling the polarization of light. New Polarizing Bandpass Filters combine a highly efficient polarizer with a bandpass filter into a single high-performance filter, and are available for 405, 532 and 640 nm laser wavelength ranges. And new near-infrared (NIR) bandpass filters keyed to popular laser lines in the 1500 – 1600 nm region highlight Semrock's capability to make high-performance NIR filters. The new catalog also features many new products that further enhance Semrock's extensive selection of "no burn-out" BrightLine® fluorescence filters and sets, including new multiband filter sets, multiphoton fluorescence filters, and dozens of bandpass filters and dichroic beamsplitters.